What did I do this past weekend? Slept in a tent for two days on one of the most beautiful white sand beaches I have ever visited with some recent but very good pals and a ton of Hong Kong locals celebrating Mid-Autumn Festival by eating mooncakes and lighting lanterns around campfires. How to get there? We took the MTR to Kowloon Bay and from there the 1 bus to Sai Kung Village, the administrative center of Sai Kung District. From there, we took a 40 minute taxi ride (but you can also take the 21R [?] from in front of the McDonalds) to Sai Wan Road, from where we hiked an hour and a half to Sai Wan, also known as Tai Long Sai Wan, the westernmost beach of Tai Long Wan (Big Wave) bay. This beach is one of my absolutely favorite get-aways from the city. The sand is wonderfully clean and soft, the water is crystal clear and the waves are just high enough to be fun to swim through. There is a ridiculously beautiful waterfall and cliff to jump off of just a 30 minute climb away and a beautiful little lagoon leading out from the waterfall into the ocean. The people in the nearby Ham Tin Village (consisting of about 9-10 little houses, including 3 eateries, one of which also rents out camping equipment) are friendly, welcoming, honest and very helpful. People tend to pitch tents either on Tai Long Sai Wan’s 2nd beach (separated from the first beach by a pier of rocks) and Ham Tin Wan. I prefer Tai Long Sai Wan mostly because it stays relatively local, while the latter is almost completely overtaken by expats. The 2 cafes of Ham Tin Wan serve fried squid rings and chili fries and a liter of Tsingtao is 40 HKD. Somehow it’s just not right. 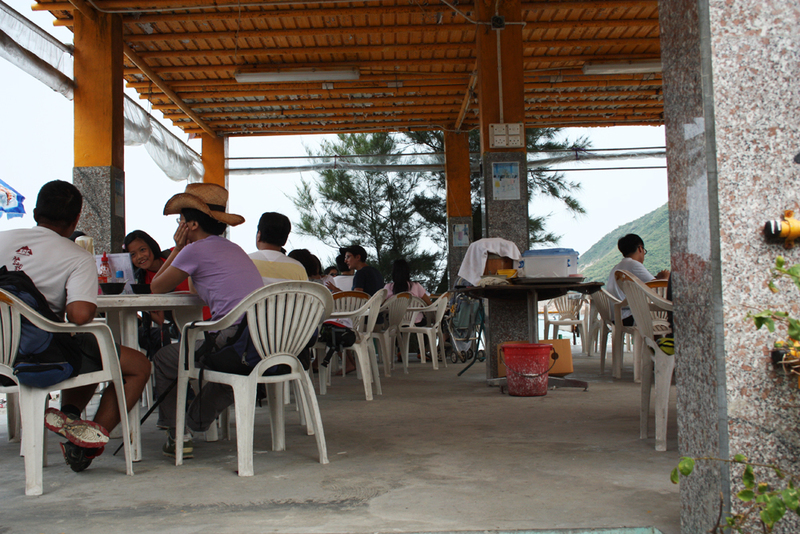 The two beach-front eateries in Ham Tin Village on Tai Long Sai Wan beach serve simple, flavorful and very satisfying dishes in very generous portions at very low prices. There are two of them. (Let’s call it) Restaurant 1 has a slightly better view of Beach 1 and slightly nicer wooden furniture on its terrace, but beers are 30-35 HKD instead of 20-25 HKD, as in (let’s call it) Restaurant 2, and they have a slightly more limited menu. Restaurant 2 also gets a bit more creative and can customize your dish sometimes. At Restaurant 2 I asked for a sandwich with tomato, egg and spam once and, after a local translated this for me to the waitress, I got just that. Then again, I did the same the next day and after an hour of waiting was told they had run out of bread hours prior… Restaurant 2 also has sweet warm bean curd pudding, while Restaurant 1 does not. The woman at Restaurant 2, while being perhaps the worst waitress I have ever met, is kind and welcoming and remembers guests from the day before. She runs around repeating either “Thank you” or “Sorry,” depending on whether she got your dish right (60% of the time) or wrong (40%), respectively. She has a kind face and is extremely fair and pays attention as much as she’s able. So, we ended up eating mostly in Restaurant 2. Me explaining to Restaurant 2 waitress how I would like my sandwich, trying to get out of eating noodle soup for breakfast again. My friend hesitant that this will work. Restaurant 2 is a wonderful little establishment. One goes there fully clothed, half clothed or just in a wet bathing suit, and sits into white plastic chairs. facing the water. The service assumes that guests are staying at the beach and are thus not in any particular rush to get anywhere. It is slow. Groups order their food together but the dishes come separately in the order they are prepared in. The dish one gets is the dish one ordered around 60% of the time. 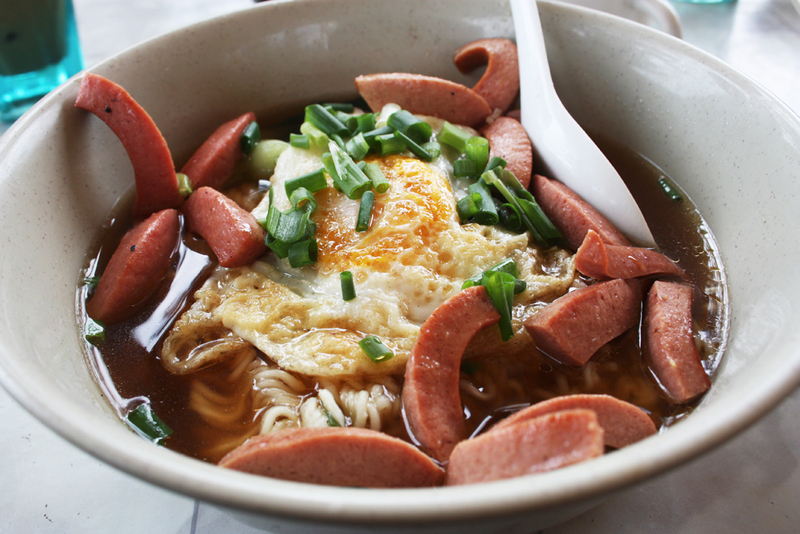 Noodle soups, which are made in large batches and then quickly dressed with Chinese broccoli, and your choice of egg, spam, hot dogs or any combination of those, come out the quickest and, really, whatever table waves the tray-carrying waitress over first gets it. 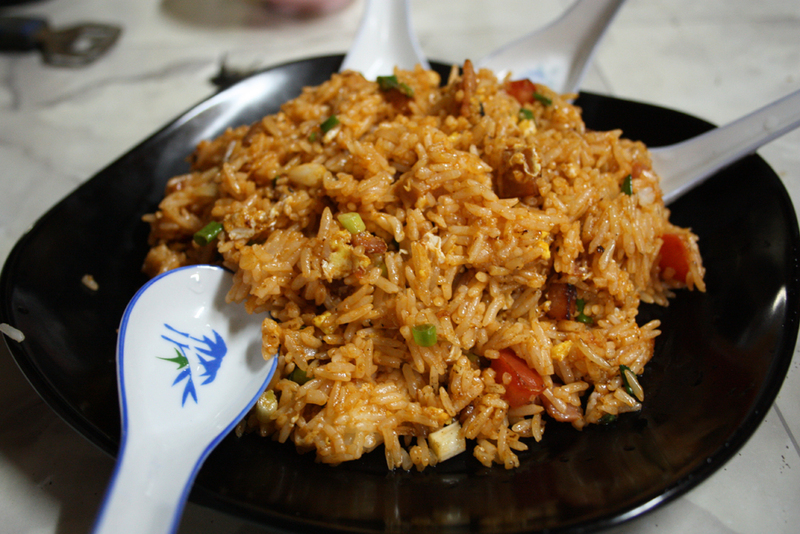 Rice and meat dishes take a bit longer. Specialty sandwiches (two un-toasted slices of white bread + scrambled eggs + spam + tomato) take the longest. Groups are better off ordering a selection of dishes to share, because as they divide and conquer a plateful, the next ones will come along in a sequence, resulting in a steady flow of eating. This is exactly what we did for dinner the first night and we got a wonderfully varied selection of noodle, rice and vegetable dishes, each of which cost around 40-45 HKD (that’s around 5 USD). 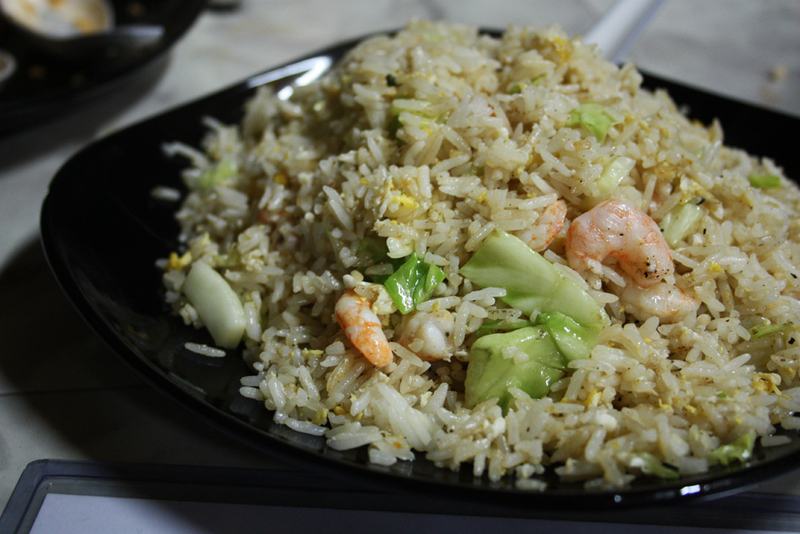 Pork and prawn fried rice. Rice cooked perfectly in both cases. A generous amount of pork slices in the former and prawns in the latter (although they were a tad on the baby shrimp end of the spectrum). Very warm and filling and satisfying. 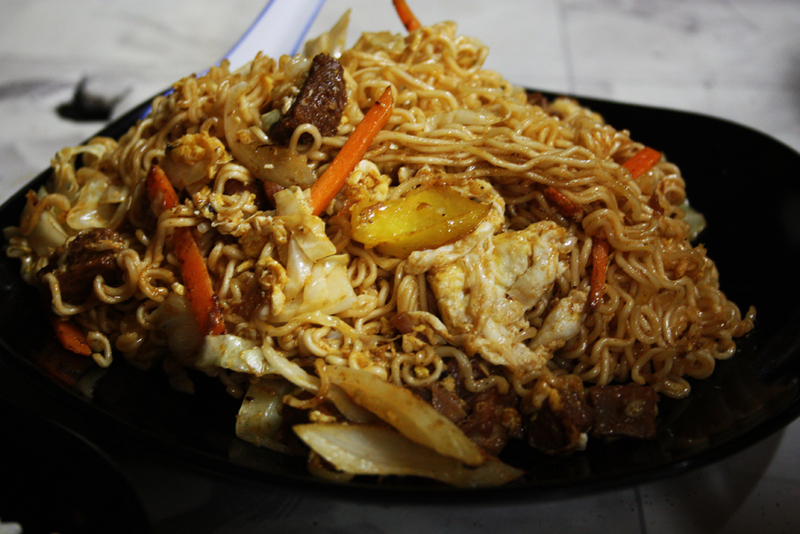 Pork and vegetable stir fry on rice and beef and vegetable fried noodles. 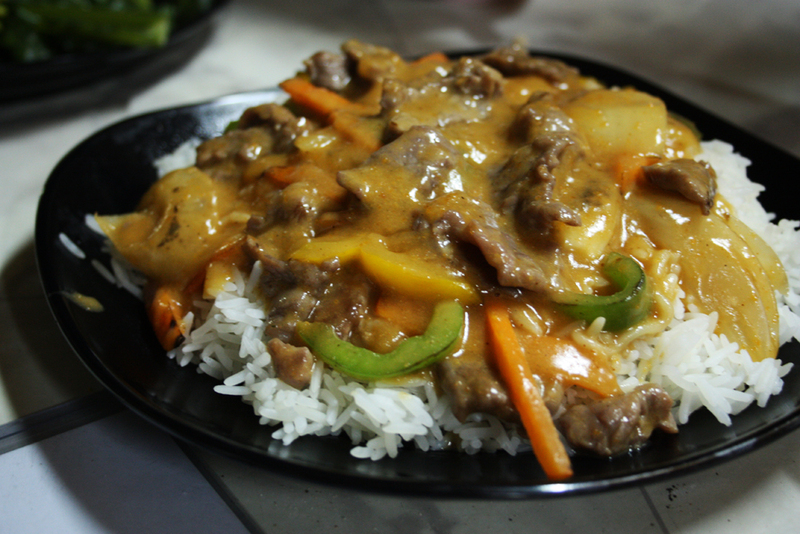 Tender slivers of pork, peppers, onions and carrots mixed into a starchy, semi-sweet sauce and poured over fluffy white rice. Not too complicated but hit the spot. Bits of beef, egg, carrots, onions and huge whole chunks of ginger (which added a wonderful floral freshness) mixed in with some stir fried ramen. Very little oil. Yum. And then there was veg. Again, very simple. 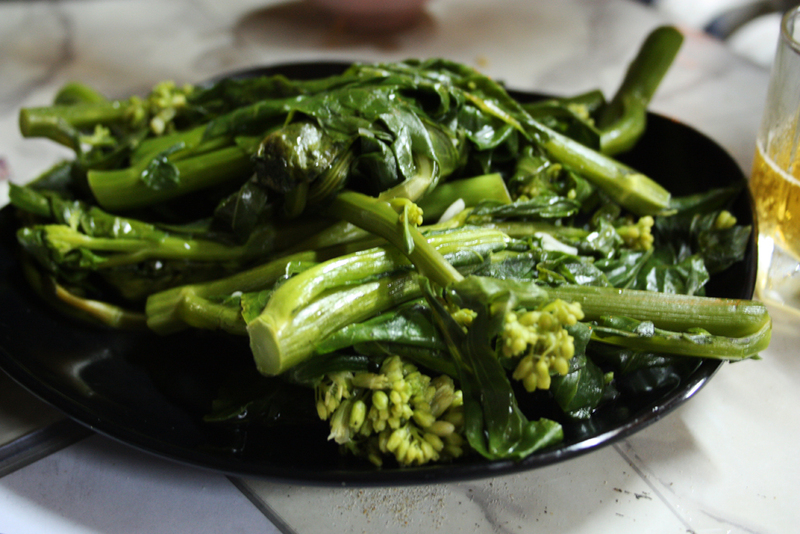 Stir-fried, slightly wilted, moist and soft Chinese broccoli with tiny little flower buds adding a nice plump bite to each forkful. A very surprisingly generous portion of whole garlic cloves tossed in to give it a nice, nutty, smokey flavor. 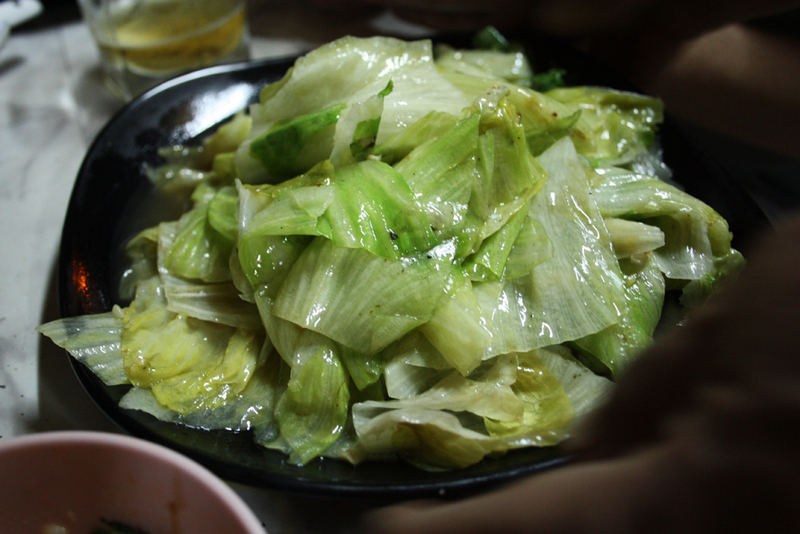 Stir-fried lettuce, buttery soft and wilted, slightly oily but still very nice combined with the other dishes. Doufuhua 豆腐花. A warm pudding made of soft, silky tofu which is formed by coagulating soy milk to form extremely delicate, jelly-like curds. Running a spoon through a bowl of this stuff immediately breaks up these pillowy, slippery curds, so it’s important to apply minimal movement to the bowl while gathering a jiggly heap of the stuff onto your spoon. 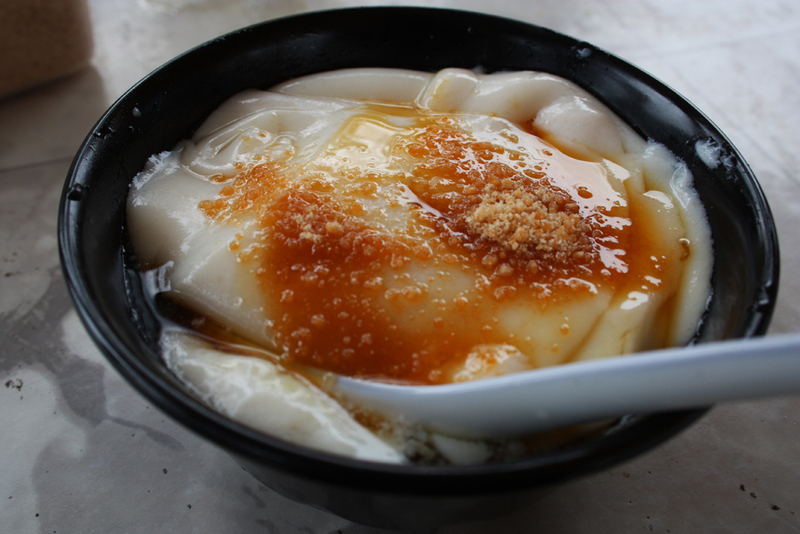 The jelly is served with a sweet sugar syrup which is flavored heavily with ginger, and a crumbly red sugar. The ginger syrup adds a tremendous amount of floral sweetness to the otherwise flavorless tofu as well as a slippery smooth texture and a bit of moisture. The sugar adds a depth of flavor and a crunch to each spoonful. The situation we had this under was also pretty cool, as it was given to us for free as a result of Restaurant 2 waitress screwing up my friend’s order (prawn fried rice instead of beef flat noodles…) and my friend agreeing to taking the rice anyway instead of sending it back and getting what she ordered. It was a nice gesture of apology, one that wasn’t really necessary but one that felt pretty damn good. On a cool, breezy summer night on the beach a hot little bowl of doufuhua absolutely hits the spot, and I ended up ordering it again for breakfast the next morning. 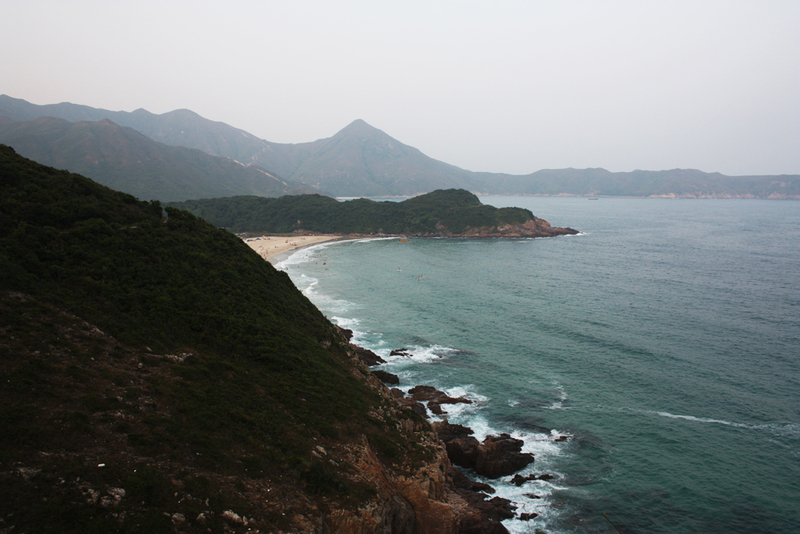 After a bit too much red wine by the campfire, I crawled out of my tent on all fours and landed face-first into sand on my first morning in Sai Wan. I needed coffee and breakfast pronto, to get my body normalized for a day in the sun. We went to Restaurant #1 and got a round of noodle soups. Definitely not my ideal breakfast when I’m feeling off already but parts of it did the trick. 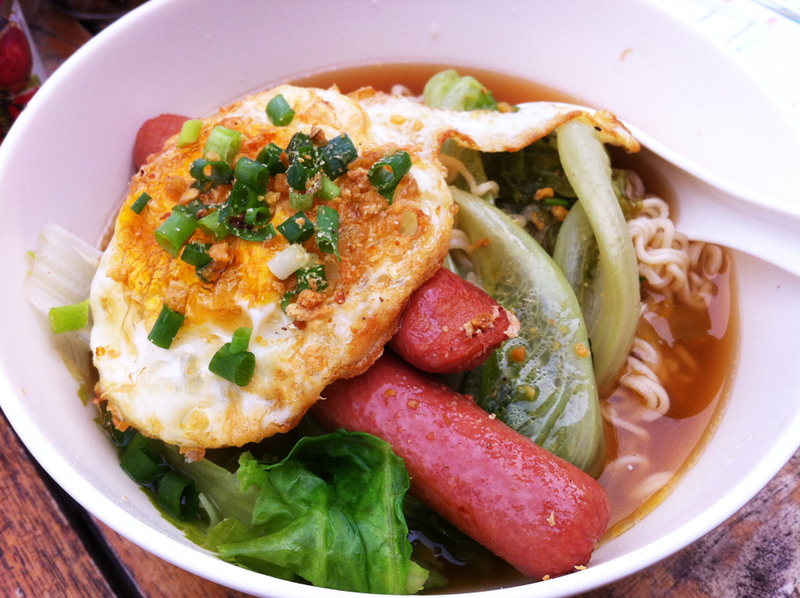 The sausages were actually hot dogs which were lain, along with a deliciously crispy, life-sustaining fried egg sprinkled with spring onions, on a bed of slightly wilted lettuce and chewy ramen noodles. First of many. This one was surprisingly delicious for the price. Also at Restaurant 1. 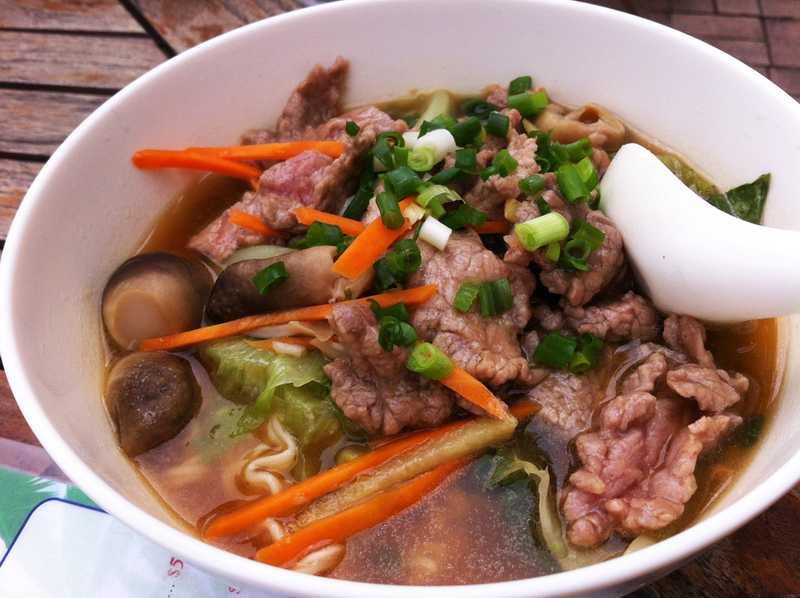 Tender and thin, just-cooked slices of pork, sprinkled with spring onions and shredded carrots, on a bed of wilted lettuce and noodles. A few slimy mushrooms were also tossed in. Despite the fact that one is never supposed to drink all of the broth in a noodle soup, as it contains a high dosage of MSG, which makes things delicious but is pretty darn unhealthy, I was pretty tempted in this case because the flavors of the pork permeated through the liquid so nicely. The ham in this case was spam from a can, salty and dense and completely fine for a camping trip. The egg was perfectly fried, still soft with very nice, runny yolk and instead of the usual lettuce, the soup contained wilted Chinese broccoli, whose supple little flower buds added a very nice little bumpy texture. 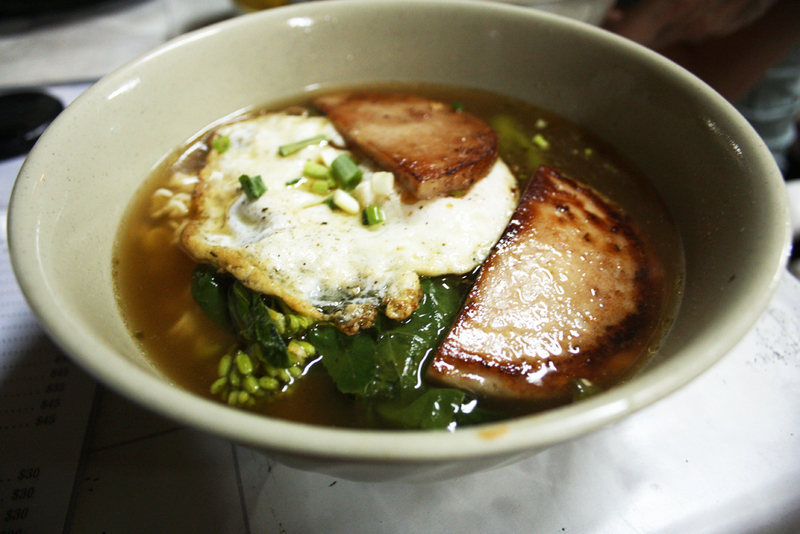 Kinda like green eggs and ham, but with a bit of noodle soup tossed in. 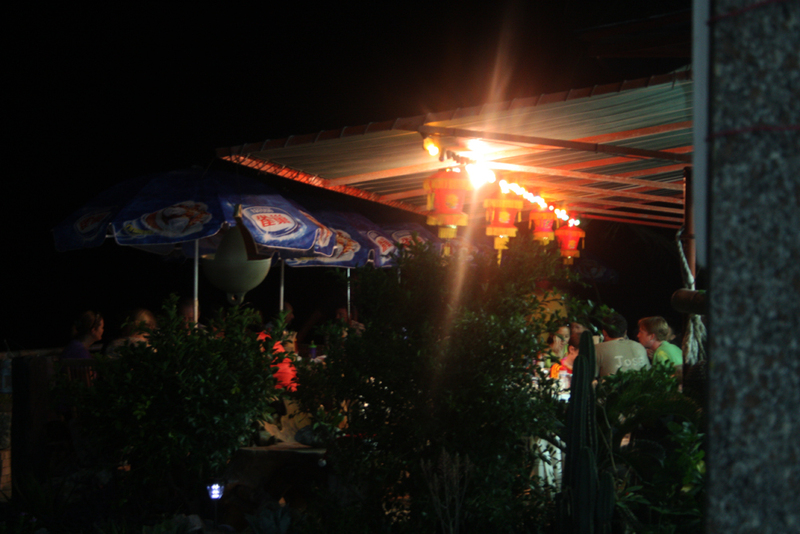 So remember – when in Ham Tin Village, Sai Kung, always go for Restaurant 2! You will not be disappointed. Where In the world is really Cochise Lili Kocsis?